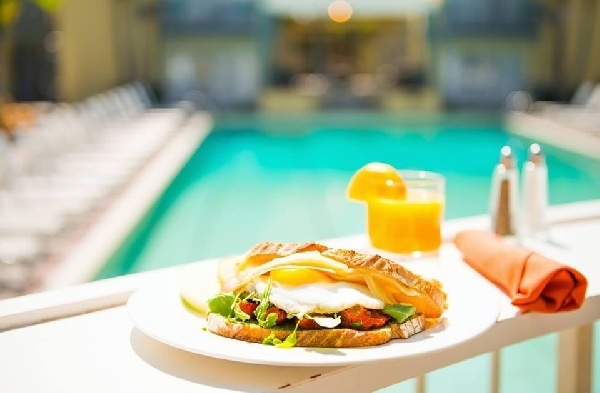 This Easter feast al fresco, overlooking the Weissmuller Pool, with Chef Ryan's classic brunch favorites, plus new menu highlights right in time for spring! Hope 46 is sprucing up their a la carte brunch menu of modern classics with options from $28 to $35. Pair it with a mimosa or bloody mary for an added bit of celebration. Limited seating available. Reservations recommended. Brunch includes assorted pastries, fruit preserves, sweet whipped butter, & choice of raspberry or lemon sorbet. English muffin, applewood smoked bacon, Dungeness crab, petite arugula, roasted tomato, classic hollandaise, chives. Classic American Burger, southern fried chicken, spicy shrimp, brioche. Yukon delta wild salmon, red quinoa, petite arugula, heirloom tomato, charred corn, julienne jicama, local avocado, tajin & lime citronette. Pacific white prawns, cavatapi rigate, kale & walnut pesto, roma tomato, baby squash, asparagus, parmesan, Italian parsley. New Zealand lamb lollipops, sweet corn succotash, wilted baby kale, balsamic reduction, chive oil.